A Head Collar for dogs that works, does not ride up under the eyes when the correct size is fitted and looks great. We have some amazing feedback despite the saturation of similar headcollars. The Simple Leader was designed to eliminate all of the flaws in headcollars sold in the UK today. Designed in 2017, this is the most tested of our products. We wanted a head halter that was comfortable for your dog to wear, did not look like all the other ones on the market, something that was well received by the dog who had previously not liked wearing dog halters. These great product reviews are genuine and backed up by our Lifetime Stitching Guarantee. Images: Padded, 19mm black with dark grey fleece padding. Dog: Royal blue, not padded, 25mm. The Simple Leader Headcollar comes in a range of colours, 19mm width with the option of 25mm width (please ask for this), plain or padded noseband or solid brass harness ring. 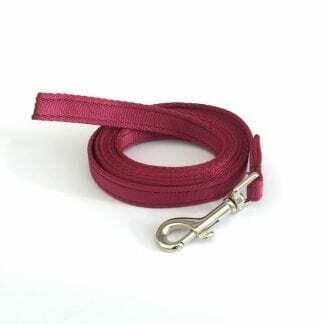 More readily accepted by dogs, easy to put on, does not inhibit the dog while off the lead, affordable and soft to wear. Our simplest most effective design yet! “I walked my dog today! The first time in about 4 months. My husband has had to walk her because she is just so excitable and so strong I could barely get her across the road to the field to let her off the lead. Don’t get me wrong, she can still get a little pull in here and there but this thing is bloody amazing! I now feel like I have enough to control to work with her and do training that I never could have done on anything else I’ve tried. She can’t get up on her back legs and yank me or swim across the pavement cutting her paws up cause she uses it for grip and pull! Seriously thank you so much!!! Walks haven’t been even close to enjoyable for months and the padding makes a huge difference to her too. Image shows Nala wearing the Simple Leader Head Collar and Safety Leash. Take a tape measure or a piece of string and a straight ruler. 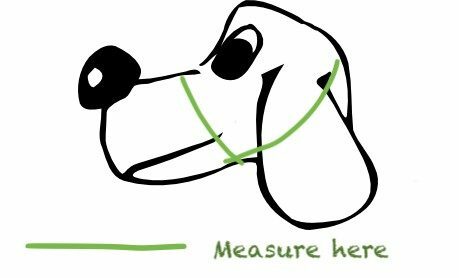 Measure the dog in one measurement in a figure of 8. Chose your dogs size from the options. This is a totally new product. 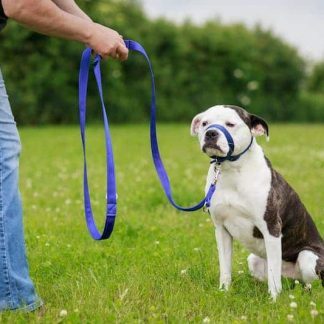 The lead compliments the Simple Leader by providing extra security in extreme cases where dogs may slip their head collar or paw it off, which can happen with anything a dog wears on its’ head. 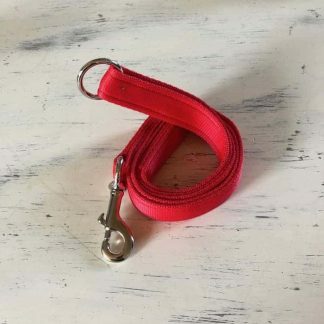 The safety lead consists of a lead that attaches to both the collar and the O ring under the dog’s chin on the Simple Leader while not deflecting from its’ effectiveness, however, please note it must be fitted correctly, see below. If you look at the image on our Head Collar Safety Lead, it explains how the lead must be fitted to get optimum effectiveness from the product. If the lead is not pulling from the head collar but in fact pulling from the collar, the head collars effectiveness is significantly reduced. 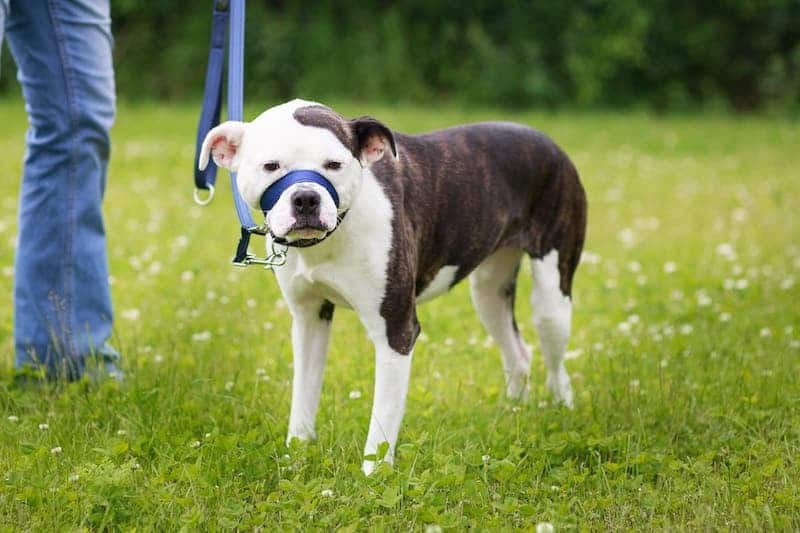 The neck strap sits immediately behind the dog’s ears, not lose further down the dog’s neck. The head collar is nice and snug so as to not be uncomfortable for the dog to wear. Be situated on the dog’s nose so as not to interfere with sight or panting. The purpose of the Simple Leader is to be able to help to reduce or even eliminate pulling on the lead. It helps to kindly guide the dogs head and the body should follow. Rely on it as 100% security if your dog is likely to be reactive or uncomfortable in any way when wearing a head collar. If your dog is reactive or is getting used to wearing a head collar, be responsible and ‘double lead’ your dog. 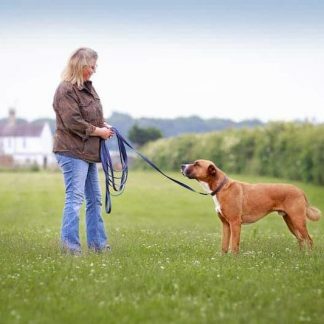 This means attaching a lead to the Head Collar and to a securely fitted collar or use a double ended lead. We do sell the Head Collar Safety Lead too which attaches to 2 products, usually the head collar and a securely fitted collar. If your dogs’ recall is not 100%, be sensible and assess the risks. Should a headcollar come off if not fitted tightly enough, then you should either not use it or follow our safety precautions above. Disclaimer – All recommendations for fitting and use must be met. Safe use relies on fitting correctly, correct use and regular inspection of your products to make sure they are in a safe condition. If in doubt do not use. Superb product designed especially for Zeus by Sarah. Zeus is a GSD who wants to play all day and a nightmare on a normal lead because he thinks everyone out there is part of his big game of life waiting to play with him. His Simple Leader has changed all of that – walking him (with 2 other GSDs at the same time) is now a pleasure. I’m in charge of him instead of him being in charge of me. Thank you Meg Heath leads and collars. I ordered the padded headcollar and am over the moon with it. Sarah was very helpful to get me the right size when I rang as I wasn’t 100% sure of which size to order. The item arrived much sooner that expected. Will certainly be ordering from Sarah again. I recently purchased a halter lead from you for my 2 year old labradoodle. He is a very strong and bouncy dog and will often pull when wearing a harness. 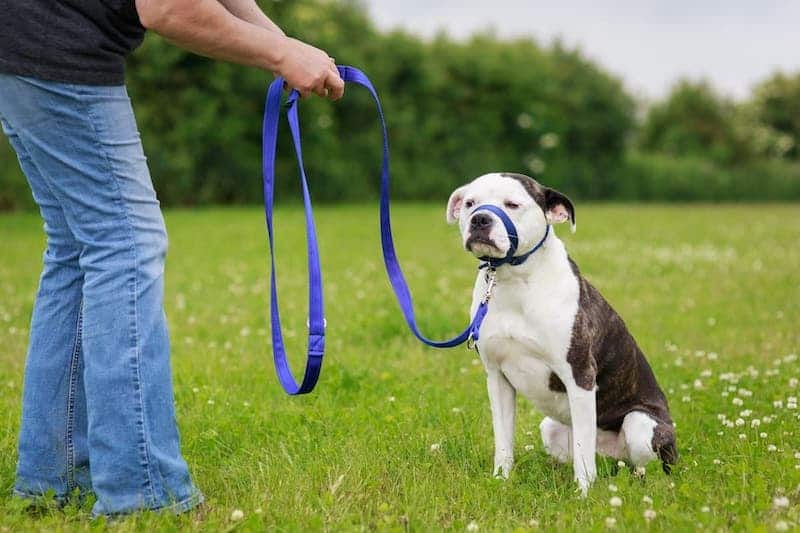 Conversely, he walks extremely well when wearing your halter lead and it seems to calm him, especially when around other dogs. Blaze is a rescue dog and not good on the lead but this product works at helping him not to pull. Would buy again although we would purchase a padded collar next time. I am very impressed with this head collar, it’s very easy to fit and completely eliminates ‘dog pulling’, our dog Bailey finds it very comfortable. Especially with the extra padding! Unlike a halti he cannot pull this head collar over his nose! My husband and I are very impressed with this collar and would strongly recommend it. The safety lead to go with this lead gives you that extra security, especially with the unpredictability of a 9 month old springer puppy!! Very happy with the products, ordered a simple head collar and training lead , both excellent quality. The head collar was special order due to size however the goods still arrived a couple of days after ordering. Have recommended to friends and will definitely be ordering again . This is the product that has revolutionised our life with Bubbles. That sounds a bit over the top, but it’s true. Since she was about six months old, Bubbles has been a nightmare on the lead. She’s not aggressive and doesn’t pull constantly. But when she sees something exciting, she is a disaster zone. Even off the lead, she reacts to dogs and runners by sprinting like Usain Bolt. And I don’t just mean she’s fast, I mean she’s upright – on two legs. On the lead, this translates to pulling, dancing, jumping and generally going mad. But look at the difference her new head collar makes! The simple leader head collar is positioned around the dog’s nose, under it’s chin and it fastens around the back of the neck. It comes in three sizes and is adjustable for the perfect fit. You can have it in a vast range of colours and with or without padding. I decided on having the padding as I thought it may be more comfortable for my somewhat spoilt pooch. There is a ring underneath the dog’s chin to attach the lead to, and this is what stops them from pulling. I noticed the difference in Bubbles as soon as I clipped the lead on. She shook her head a couple of times but didn’t even attempt to pull on the lead. If she does try to pull, her head turns slightly to the side but generally, she doesn’t even try. Walking her has been a much calmer affair for all of us. She no longer tries to jump on Pluto, I’m not constantly battling with her and she doesn’t get worked up when she sees a dog. She seems much more laid back herself too, it can’t have been much fun for her being so highly strung all the time. The best thing of all has been the way her relationship with the children has changed. They can now walk her on the lead or run around with her. She’s not pulling them all over the place and they don’t get frightened when she sees a dog. Excellent headcollar. Easy to fit and use, and can walk dog on either side. I use it with the Meg Heath headcollar safety lead. My dog’s measurement was between size 2 and 3 so used the comments box on the order form and received a very prompt reply from Sarah. Just ordered a second headcollar to keep in the car. I have just bought this for my mums cocker/clumber Spaniel who quite frankly was a nightmare to walk . Today I have put this on him along with the new lead that suits the head collar and we’ve have had the most harmonious walk ever after his initial reluctance obviously, but after the first five minutes we were striding out round the block with confidence and a happy relaxed dog. Thank you Sarah for a great design and a speedy, professional service. Love this head collar! It’s comfortable for the dog and works excellently. So much so that it isn’t needed after a few weeks of working with a particular dog. He is now back on a harness and walks beautifully. I can only highly recommend the collar and matching safety lead! Absolutely love this product. First day I got it I took my dogs on a 2 hour on lead walk and they walked beautifully, before a 5 minute on lead walk would drive me crazy. Was also able to lead them off lead wearing them and they were completely fine wearing them. Nice bright colours too! Head collar worked wonders. Xeena resisted at first but it was so good that there was no pulling, recommended to everyone who has a pully dog … It’s amazing now she is not pulling … i dont hurt, i have problems with my hips and when she pulled it really hurt. Super speedy service with good communication. Bought two headcollars and have been out using them today both fine fitting well on my dogs faces no loose gaps works well when they swop sides on walking too. Seem very strong. Very happy. This headcollar is 100% PERFECT! Put it on Ollie this morning, he once rubbed his face but from then on he was very happy to wear it for the whole walk and, because he has it on (and he knows) he walked perfectly. Because of the fit unlike a ‘Halti’ it can stay on the whole time and doesn’t inhibit the dog at all. There are no loose bits to catch on anything so its perfectly safe. It is so simple and easy to use and it works very well indeed. I am a very happy lady thank you Sarah.